UNISON’s higher education service group executive committee, which decides UNISON policy on higher education, between UNISON HE conferences, is consulting members on the higher education employers’ 2018 final pay offer. The consultation will take place between 9 and 30 July. The employers have offered staff £425 or 2% (whichever is greater). The pay offer is more than has been offered in recent years. However, our pay claim was significantly higher to make up for the losses that have built up as a result of previous below inflation pay offers. The 2% offer meets neither inflation nor our aspirations. 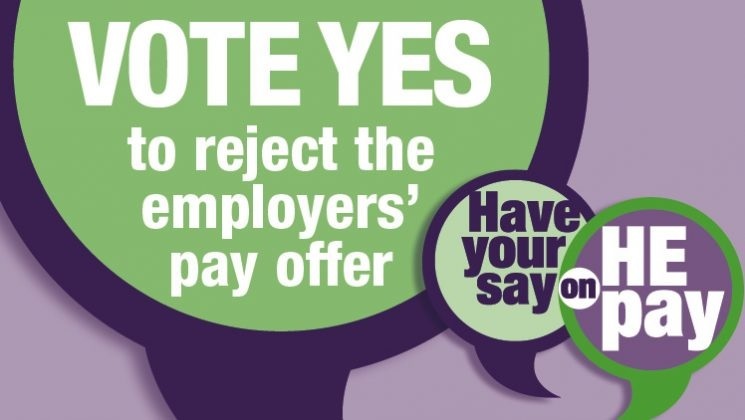 In line with UNISON’s HE conference decision that the HESGE should reject any offer below our pay claim we are recommending that members vote yes to reject the offer. You can see there is a significant difference between what we think HE staff are worth and what the employers think. That’s why it is important that UNISON HE members vote in this consultation and send a clear message to the employers that we want a better offer. UNISON’s HESGE recommends that members vote ‘yes to reject’. The HESGE will meet in early August to consider the results. If members reject the offer in this consultation ballot – by a significant majority – the HESGE will request a full industrial action ballot. If that ballot confirms rejection of the pay offer and meets legal thresholds we will seek co-ordinated and escalating industrial action with other unions in line with UNISON rules. A good turnout in the consultation is crucial, as is a clear vote to reject the offer, as trade union law means we can only take strike action if we get at least a 50% turnout in any full industrial action ballot.